The build-up of dirt and grime on your properties fascia and soffit boards can leave your home with a tired appearance. You may be worried that your plastics are too dirty for cleaning to be effective, but our purified water fed pole system consistently brings properties fascia and soffits back to like new condition. 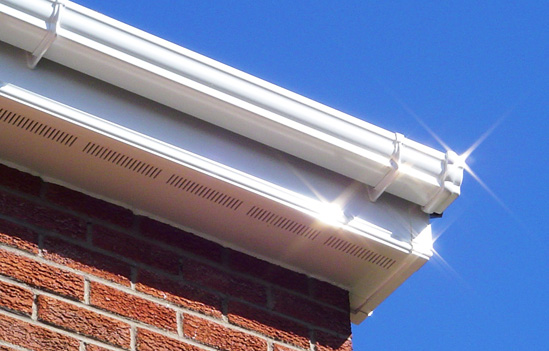 Restoring or maintaining your home’s fascia and soffits isn’t an expensive job, and is more cost effective than having to replace tired looking plastics. We offer a complete clean to bring fascia and soffits back to new again, including the exterior cleaning of your gutter pipes as well. Regular maintenance cleaning – helps to keep your property looking great. Full restoration cleaning – bringing your fascia and soffits back to like new condition. The above also includes exterior gutter pipework cleaning. No harsh chemicals – we only use 100% purified water. No ladders required – all cleaned from ground level. Fully insured, CRB checked and uniformed staff. There are many reasons to keep your fascia and soffit boards clean, you may have family visiting, are selling your house, renovating or simply want your home to look as good on the outside as it does inside. Our fascia and soffit cleaning provides excellent results and can be scheduled to fit your needs. If you have noticed your gutters are blocked and the overflow of water is causing damage to your fascia and soffits we also offer a complete gutter clearing service, which can be done at the same time as your fascia and soffit clean. Find out more here. To find out more or for your free residential fascia and soffit cleaning quote please contact us or visit our FAQ page for further details.